It is interesting that you posted on George Dierssen. A few weeks ago a fellow & his family were in my wife's antique store looking at some of the bottles for sale. He was looking for a Buffalo Bourbon. Turns out he was George Dierssen the third, great grandson of George Dierssen. He told me that his family had destroyed all of the remains of George's liquor related artifacts. George the 3rd was trying to put together a collection of what his family had earlier destroyed. He claimed to have known you. What do you make of this? if it shiped from the port in that district of ky. TRUE Bourbon comes only from Kentucky, a fact that is well known among whiskey afficianados. Bourbon County is the "heart" of this district. Google is not always the correct way to research. G.O., I am well familiar with the Dierssen family record and do know old George. He is a fellow delta farm and land owner and we have had dealings with him on occasion. It is true some of the family went out of their way to seek out and destroy any evidence of them being in the liquor business. There was no way for them to find the hundreds of buried bottles, though. 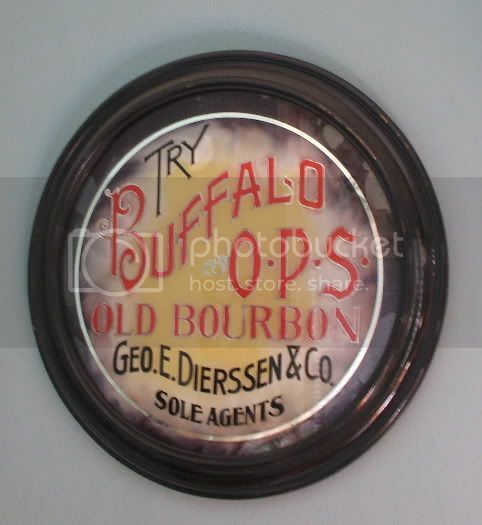 The reverse glass sign hung in an Oak park saloon called "Steen's", and is evidently the only piece not destroyed in the "Dierssen purge". 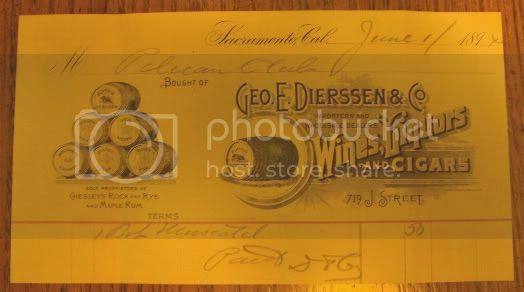 The Dierssens also had a market in Sacramento called "The Pacific" that was quite successful itself. the old bourbon district is only in kentucky and about one forth of the state .port on the ohio river it shiped from was maysville, now mason co.
Just did a search and found your posts. G.O. - that was me that stopped by your antique shop. It's great to see some of my family's history, what a great hobby you have. I would like to think one day I will have time to participate.